Monster Casino will then reward you with a bonus (Welcome Bonus is for new players only). The terms and conditions of the bonuses vary between different casinos and might also change over time and between different countries, so it is important to compare the different offers and read the T&C for Monster Casino before signing up. Do you remember Mike from the animated movie Monsters Inc? Well, the same green one-eyed creature will be your host at Monster Casino, a relatively young gaming venue launched in 2017 and licensed in the UK. Here, you will find a great variety of casino games supplied by some of the biggest names in the industry and you can use a £5 no deposit bonus to give some of them a try. New customers can take advantage of a generous welcome package while regular ones can join slot tournaments and make use of daily promotions. Customer support service is available via multiple channels, so you can rest assured that all problems will be taken care of in a timely manner. Owned by Nektan Limited, Monster Casino runs on a multiplatform that allows you to play all the games in instant-play mode with no download needed. The list of contributing developers may not be long, but it includes the industry giants like Microgaming, NetEnt and IGT. The good news is that the gaming venue performs on handheld devices too, so you can enjoy loads of entertainment wherever you are directly from your mobile browser. Slots comprise the most diverse section of the casino with hundreds of titles on offer. In the Player Favourites section you will find the most popular titles of the moment like White Rabbit from Big Time Gaming and Wild Seas from Play’n GO. Iconic slot releases like Starburst and Immortal Romance are also available as well as a collection of progressive slots including those from the Mega Jackpots series by IGT and Divine Fortune from NetEnt. The Casino Games section is home to virtual table games and Monster Casino offers 17 Blackjack and 2 Roulette variants as well as Oasis Poker, Texas Hold’em and Punto Banco. Under the Instant Win category you can choose from scratch cards and lottery-like games. Cash Buster and Cash Buster Tower are also included in this selection of games. Most gaming venues today offer live dealer tables and Monster Casino is not an exception. The Live Dealer section offers a wide range of live tables powered by Evolution Gaming and you can try your luck on Blackjack, Roulette, Baccarat or Poker variants and enjoy a gaming experience closest to one a land-based casino would provide you with. 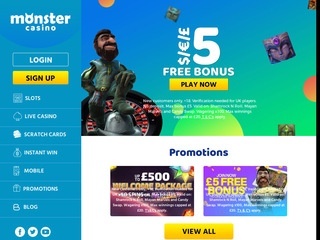 All new players who sign up with Monster Casino will get a £5 bonus with no deposit required. This bonus carries the playthrough of 100x and can be used only on the exclusive slots Shamrock N Roll, Mayan Marvels and Candy Swap. As soon as they make their first deposit, new players will have a chance to lay their hands on a welcome package of up to £500 and 50 free spins on Starburst on top. Free cash will be distributed in the following way: on your first deposit you will get a 200% match bonus up to £50 and 50 spins on Starburst, your second deposit will be matched with a 100% bonus up to £200 while the third deposit comes with a 50% bonus up to £250. A minimum deposit of £10 is required to be eligible for each of the three deposit bonuses. Winnings from the spins are subject to the playthrough of 30x the amount earned while bonuses carry the wagering requirements of 30x the deposit and bonus amount. 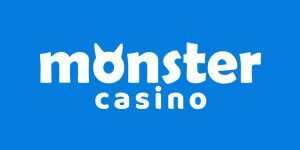 Monster Casino also offers a range of reload bonuses called Booster Bonuses with different rates and amounts going up to £200. If slots are your cup of tea, check out Free Spins Frenzy promotions offering up to 40 free spins on the featured games. The gambling site also has a rewarding loyalty scheme granting regular players privileged status. To become a privileged member of the casino community, you have to be invited by the casino, but you can also get in touch with the customer support team and learn how to become one. Privileged players can make use of cashback offers, weekly bonuses, deposit rewards and free spins. A wide array of banking methods is supported by Monster Casino such as Visa, Maestro, MasterCard, Neteller, Skrill, PaySafeCard, iDEAL, Sofort, GiroPay, Trustly, Boku and Zimpler. You can deposit at least £10 while the minimum sum you can withdraw is £20. On a daily basis you can withdraw as much as £2,000. Withdrawals are subject to checks that can take up to 3 working days while the time needed for cashouts to be processed varies between 24 hours and 7 days depending on a preferred banking option. The accepted currencies include GBP, EUR, SEK, CAD and NZD. You can get in touch with customer support representatives via email, telephone or live chat, but keep in mind that assistance through live chat and phone is available only between 08:00 and 00:00 GMT. Make sure to check out the FAQ section too, as it offers useful information on the casino policy and banking.